Solar thermal water heating systems use solar energy from the sun to heat up water which can be used as part of your domestic hot water supply. Installing a solar thermal water heating system will cut your energy bills and from April 2014 you can also claim Domestic Renewable Heat Incentive tariff payments for generating your own renewable energy. Solar thermal water heating systems have solar collectors which are normally fixed onto a south facing roof to maximise the amount of sunlight they are exposed to. Solar collectors contain a fluid which absorbs heat from the sun and this heat is transferred to water inside your domestic hot water system via a series of pumps and a solar coil inside a hot water storage cylinder. Some householders have a separate hot water cylinder dedicated to their solar thermal water heating system. The heated water is available to use in your domestic hot water supply and the solar fluid is pumped back to the solar collectors to be re-heated. 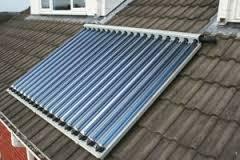 Solar thermal water heating systems which qualify for Domestic RHI tariff payments include solar thermal flat plate collectors and solar thermal evacuated tubes. Solar thermal water heating systems are very efficient and need little maintenance but will almost certainly require a back-up water heating system such as a boiler or immersion heater. Householders installing solar thermal water heating systems can cut their water heating bills by as much as 75% if the system is exposed to a sufficient amount of sunlight. Domestic RHI pays a tariff to installers of these renewable heat energy systems for seven years at a rate of 19.2 pence per kilowatt hour of renewable heat energy generated. Rather than measuring the heat output with a meter, it is based on an estimate of the systems performance which is part of the Microgeneration Certification Scheme (MCS) installation. Income from the scheme will vary according to the amount of hot water a household uses but it is estimated that the annual Domestic RHI tariff payments for a two person household will be around £190 per year, whilst a six person household could earn up to £460 per year. Solar thermal flat plate panels are approximately 2 to 2.5 square metres in size and several would be installed in an individual installation. They can be fitted directly onto roof tiles or can be built into the roof’s structure in place of the tiles. 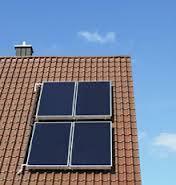 Being flat, solar flat plate panels are most efficient if your roof is directly south facing. Solar thermal evacuated tube systems consist of up to 30 or so insulated, toughened glass cylinders which, because of their rounded profile are able to absorb sunlight at any angle to their surface throughout the day. This means that solar evacuated tube systems are usually more efficient than solar flat plate systems which can only be at their most efficient when the sun is directly overhead. How much is a Solar Thermal Water Heating System? The cost of solar thermal water heating systems is determined by the amount of hot water you would like the system to provide. The larger your home, the more evacuated tubes or flat plate panels are required and the more expensive the solar thermal water heating system will be. Typically, however you should expect to pay between £3,000 and £5,000 including VAT at 5% for a system to cope with the hot water requirements of a 3 to 5 bedroom home. This cost would include the solar collectors, a pump and a new hot water cylinder with a solar coil inside. Solar thermal water heating systems qualify for a Green Deal Loan where repayments are made out of future savings in energy bills. The amount of the Green Deal Loan may be restricted by the Green Deal Golden Rule which requires that repayments should not exceed energy bill savings. Consequently, the Green Deal Loan would probably not cover the full installation cost of a solar thermal water heating system. However, with Domestic RHI tariff payments being paid for seven years all householders should experience a positive cash flow if they install a solar thermal water heating system. Solar thermal water heating systems require very little maintenance but it will probably be necessary to replace the anti-freeze in the solar fluid every few years, which including routine servicing should cost no more than £200. How much space will the system require on my roof? – You need around five square metres of, ideally, south facing roof space for a solar thermal water heating system to work effectively. Will the system still work if my roof doesn’t face south? – Solar thermal water heating systems work best when fitted on a south facing roof but they still work in cloudy weather as they can still absorb the sun’s radiation. Due to their shape, evacuated tube systems will be more efficient in this situation or alternatively they could be fitted onto an ‘A’ frame built on the ground. Will I need a new hot water cylinder? – Some hot water cylinders can be fitted with a solar heating coil conversion kit but if not you will need a new hot water cylinder with a solar heating coil built in. You may however, consider installing a second, separate hot water to store water from your solar thermal water heating system. Are solar thermal water heating systems compatible with central heating systems? – Most central heating boilers are compatible with solar thermal water heating systems but if you have a combination boiler which works without a hot water tank you will need a survey to determine whether a solar thermal system can be installed. Do solar collectors require planning permission? – You may need planning permission to install solar collectors on a listed building or in a conservation area. In most cases planning permission will not be required as planning laws were changed in 2008 to make solar thermal water heating systems exempt.